is not true, here is a challenge. If you can prove the Captain Robert Ellicombe/Confederate Son Story I will give you a Gold Plated, Vincent Bach Stradivarius Field Trumpet (bugle) valued at $2000.00. This is rare instrument-one of the kind made for the US Army Band used at the Tomb of the Unknowns at Arlington-like the one pictured below. Proof of the existence of Captain Robert Ellicombe. 1. You’ll need his unit and pension records. Remember he has to be in the US Army at camp at Harrison’s Landing during the summer of 1862. 2. The name of the son and where he is buried. 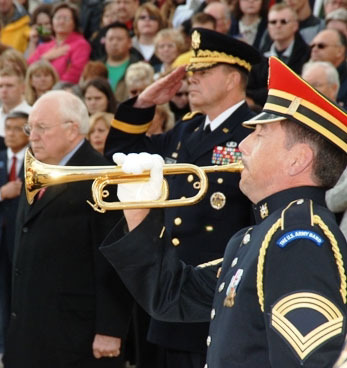 This entry was posted on Saturday, April 23rd, 2016 at 9:30 am	and is filed under Bugle Stories, Buglers Through History, Bugles for Performing and Collecting, Getting Started on the Bugle, History of Taps, History of the Bugle, News, Taps in Recent History, Taps Performance Guidelines, TAPS150. You can follow any responses to this entry through the RSS 2.0 feed. You can leave a response, or trackback from your own site. For a historically accurate and fitting arrangement for performance see, “Extinguish Lights” (or Taps) on page 38 of The Bugler’s Call Book under the heading: Cavalry Calls, contained in the back of Elias Howe’s United States Regulation Drum and Fife Instructor published in 1861. Most assuredly “Taps” was not a Confederate music composition. No one said it did….